This has been the biggest hassle of the entire project. The contractor I hired to insulate with spray foam started the job on September 25th, and just got around to finishing it on October 22nd – 4 weeks later! There are still some issues with the work he did, but I am done with him now. It all started on 9/25 when he showed up to do the spraying and the generator he rented was not big enough to do the job. He got about 15′ of wall space done before the generator started having problems. He then told me he would get a different generator that week and have it done by Friday. So, I show up at my cabin the next Weekend and nothing was done. I tried calling him on his cell and he would not return my calls, and did not return my many calls until later the next week when he said it was done. On October 9th I went to the cabin to start hanging the drywall assuming the insulation was done. At first glance it looked as if everything was OK. I then started looking at it a little closer and thought the foam was a little thin. I got a nail and started probing the foam depth and found the newly sprayed foam was consistently less than an inch thick, and even as low as 3/8 of an inch in many places. BTW, the signed contract for the job specified 2″ of foam on the interior wall. After tracking him down I brought him out there to see what was done. He admitted that it was done incorrectly and told me it was one of his employees who had sprayed it. He said he would personally fix it and make it right that week. Needless to say, it took him another two weeks to finish the job and there were still some things he did not spray correctly. OK, I’m done complaining about the insulation and will actually start talking about it. I had chosen to use a closed cell spray foam insulation to prevent any condensation from forming behind my walls. Since the steel walls of the container are a perfect vapor barrier, any water vapor that can get behind insulation in the cold months will readily condense on the steel walls. Two inches of sprayed closed cell foam insulation is not only a good insulator (R13), but it is also a seamless vapor barrier and will not allow any water vapor to travel behind it to the steel walls. I had them spray 2″ on the interior walls, 1″ under the containers, and 2″ on the outside top of the containers. While this is not a lot of insulation, keep in mind that this is mostly a three season cabin with a capable wood stove (Jotul 602) and very cheap wood. I recognize that insulating the outside top of the containers is probably somewhat of a gamble. The conventional, and safe, choice would be to insulate the interior ceiling, although being 6’2″ tall I really did not want to lose any interior height. I also kind of like the look of the corrugated steel roof inside. The potential problem here would be the loss of heat at the edges of the ceiling causing condensation to form inside. If I do get some condensation, I plan on using an anti-condensation coating from Mascoat Industrial. This stuff is very different from the insulating paint scams that abound, and has been used successfully by boating enthusiasts to eliminate condensation in their boat hulls. I will try and post a follow up sometime this spring to let everyone know how the external ceiling insulation worked. This entry was posted in Construction on October 25, 2010 by Steve. I am enjoying your blog on the construction—just found it today. I would like your opinion of the the feasibility of a container house in central Alabama. Temps range from mid-teens to low-100s. appreciate your time and effort to post the blog. Shipping container homes have been successfully built in climates ranging from Canada to the tropics, so Alabama should be no different. Something to keep in mind about my project is that it’s a cabin and not a home. If I was building this as my primary residence, I would have done things very differently. I also would have hired an architect and builder who is familiar with this type of construction. You might also want to search through the bobvila.com website. There are some good videos there about a container home that was built in Florida. The building methods for that house are probably more appropriate for your location. I have a couple of containers on my property. I modified one into a cabin of sorts and was referred here by another doing the same thing. Currently, my cabin is just a 40 foot box with a door and a few windows cut into the sides and an internal wall with another door and a window to use as the main entry when the big doors are opened. The container is really raw inside yet, no insulation or anything. I think I would rather buy the kit and do it myself instead of hiring a contractor. Eventually, I will be spanning a floor and roof between the two containers to make a more livable space but when I am there, the box is fine for just me. If you are considering a DIY spray foam kit, I’m not sure you will save much money over a contractor. The ones that I priced were about the same as my contractor applied – about $2 per square foot (2″ thickness). Something I would consider if I were to do it again would be a hybrid approach with both foam boards and DIY spray foam. Glue as much 2″ foam board as possible to the walls at just $0.60/sq ft, and then spray foam the seams, corners, and edges to seal everything up. As long as the all the seams are sealed, water vapor should not get behind the foam to the colder steel walls. The Foam board/spray at the joints isn’t a bad idea and is very easy to do even for someone who isn’t heavy into DIY. Did you paint the interior metal walls prior to installation of framing? Like a “rustoleum” style paint to prevent it from rusting inside out? The inside walls were already painted, and since the containers were new it was in excellent condition. The spray foam sticks to the painted surface like glue and is actually hard to scrape off. The other thing to keep in mind is that these containers are made of Corten steel which naturally resists rust through. Thanks for sharing. I have a 20ft container and would like to get another one. I’m excited about getting it to a livable state. I am still not sure how I want to go about insulating and I would like to cut the least amount of holes into the containers. If you were to insulate again would you do it differently. Do you think it’s worth insulating the floor ? I am on the west coast, so it dips below 0 but not often, it’s the dampness and condensation that I worry about.Thank you again and I expect to be sending many ??? your way. The only thing I would for sure do differently would be to find a different contractor, or do it myself. As I discussed in one of my responses above, I might also consider doing a hybrid approach with both foam board and spray foam. The single most important thing in my mind though is to use closed cell foam insulation. It’s critical that all of the metal walls be covered with foam to prevent condensation behind the finish wall. I did take a risk by insulating the ceiling on the outside, but so far it seems to be working well. In regards to insulating the floor in your climate, you could always try it for a single winter and see how it works. My new containers were sprayed on the underside with some sort of protective black undercoating that would probably be a good defense against any dampness. You might want to check and see if your container has anything similar underneath. If that doesn’t keep you warm enough, you could consider just gluing 1″ foam board to the wooden portions of the floor on the underside. You could also spray foam on top of that if you needed more. Please keep me up to date on your container build. hi Steve, thank you for your ideas on the 20×8 Your time and energy spent on your site is very much appreciated. I have not progressed very far with my container. I have put down the flooring and am now trying to figure out how to easily and least expensively insulate the walls and ceiling. I am thinking of using the stiff 2inch insulating sheets and then foaming any gaps with foam insulation. So as not to lose anymore space then necessary I thought I would frame it out with 1x2s. Will this be enough to keep away condensation, mold and all the ugly things that go with trapped H2O ? Thanx again for sharing. I really don’t think 1x2s have enough structural strength to support any type of wall covering. I have seen where others have used 2x2s that are glued to the metal walls with construction adhesive, but I would not personally be comfortable with that since I think some sort of insulation needs to be on the walls. The smallest wood stud I would be comfortable with is a 2×3. The smallest stud I would ever consider using would be the 1 5/8″ steel studs that I used in my existing cabin, although I would decrease the stud spacing considerably in the areas that were not tied in with spray foam. If I were going to use larger studs, like 2×3’s, I would make sure to space them so that they lined up with the outward corrugations of the metal walls. You might have to deal with some non-standard stud spacing, but it would provide the most space for insulation between the steel wall and the stud. Using materails that wont develope mold such as FRP ( fiber reinforced plastic) products and steel framing and concrete are your long term investment. Sheet rock , wood and paper products are the foods for mold growth, and temporary at best. Improper / inadequate ventilation / air exchange. Is your biggest contribution to a sick home. Top to bottom, coated with a thick elastomeric coating and earth mound and sod/ garden roof and full side southern exposure. And paint the inside steel with quality mildue inhibitor paint. It is a green product that installs rapidly, has built-in electrical chases and non rotting studs, is inexpensive, insulates to R14 and the company is easy to work with. Much less hassle to install, and is a natural for container construction. Worked great in my basement, used construction adhesive to attach it to the concrete walls and screws to attach it to the one half wall I constructed from dimensional lumber. I plan to use it in a transportable house I’m planning now. Interestingly, it’s not much of a leap from transportable houses to container houses, as I have found a few people mounting the containers on transport wheels to move them around. Let me know what you think about this product. While an interesting product, I would never use it for insulating a shipping container. As a rigid and flat product, there will naturally be an air space between it and the exterior container wall – remember that container walls are corrugated. Any crack, hole, or other opening through this product would allow moisture laden warm air to enter into that air space. This moist air would eventually condense on the cold steel walls and form puddles behind the insulating panel. And since the panels are themselves a vapor barrier, the water would not be able to evaporate out. I would never want to rely upon the long term integrity of a separate vapor barrier to keep humid air away from the container walls. As problematic and expensive as it is, I just don’t think there’s an alternative to spray foam insulation for shipping containers used in cold climates. This is the only way to create a vapor barrier that is integrated into the container walls. The only exception to this would be if you wanted to insulate the outside of your containers, which can be a perfectly acceptable method of insulating. I do appreciate you looking out for different ideas though. This product has been used on the outside of conventional homes. I hadn’t considered the corregated walls since my basement doesn’t have them. Worked great in my application, and I would think simply taping the seams would complete the vapor barrier. Water is insidious, though. Where did you buy your containers and were they HQ? I’m also 6’2 and think the higher HQ containers would be best. Any idea on approximate cost of new versus used? Also, any idea on various siding options to cover the exterior in florida? I saw Bob Vila’s videos on the St. Petersburg, Fl house and they welded steel sheet panels onto the container to make a flat finish then applied ceramic paint. It looked like a painted steel box and not very attractive. I’m just wondering how you would attach siding to the outside. With furing strips??? I purchased my containers new from Cherokee West Enterprises (530-547-5408), although they were not high cubes. I thought about high cube containers, but the extra height (and associated extra cost) just wasn’t worth it to me. If a high cube was tall enough for a functional lofted area, 10-11 feet maybe, I might reconsider. In any case, my ceilings are close to 8′ high (93″) which is more than adequate for a cabin. I never really compared the cost of new vs used since I had always planned to use new containers. The advantages of new containers far outweighed, at least for me, what I could have saved by going used. I was able to get three containers from the same manufacturer, with the same dimensions, same door mechanisms, and the same color. If you’re going for the distressed, mismatched look, then by all means save some money and get used. In regards to the exterior, I feel if you’re going to use containers, then your building should look like one. The steel exterior of a container is one of it’s strongest attributes, so why would you want to cover it up? If you must cover it up, you can attach vertical wood strips to the exterior with welded on L-brackets and side as usual. I would also give serious thought to insulating the exterior in that case as it will save considerable interior floorspace in the process – if you like metal walls as your interior finish. We have just purchased a 20ft opensided container to convert into a catering facility. We are thinking of building stud walls and using celotex/kingspan as insulation and board with a product called Respetex (wbp plywood 11mm and lamented covering). We would leave a small gap between the stud walls and exterior, then would put a few vent grills in the walls. The container is going to have a roof and be clad on the exterior with timber (log cabin look alike) which again would help with insulating. As we live in rural Wales (UK) the prices are extremely expensive for the spray foam insulation. But this issue with condensation and not knowing what is going on once you put those boards up is extremely worrying. Our temperatures range from -5 to 25 degrees, but it is damp – that’s why Wales is so green!!! What to you advise?? Using outside vents to allow moisture to escape from the walls is an interesting idea, but not one I would personally use. It’s not that it wouldn’t work, it’s just that I wouldn’t be comfortable doing it. The first problem I could see, which may not even apply in your climate, is if you would ever want to use air conditioning. In this case you would have a cooler interior wall that warm moist air from the outside could reach and condense on. The second problem I would worry about would be insects and other pests. Unless your vents are perfectly sealed, with properly sized screen, insects could find their way into the wall cavities and nest there. As I have said before, the only insulation I trust to be used on the inside of a shipping container is closed cell spray foam. If I absolutely had to use something other than spray foam insulation, I would install it on the outside. In that case you just weld some small metal tabs to the exterior, affix some wood strips/boards to them, insulate between the strips, and then install some siding as usual to the wood. This has the added advantage of giving you more interior space to work with. Sorry, didn’t explain myself properly. The shipping container already has two sets of air holes (vents) at the top on the back wall. The vents we would put in would be on the interior walls (either top or bottom), maybe we should close the outside vents (no insects) and hoping that the air from the inside would stop the condensation?? As we will be cooking in the unit. Most of the front will be open all day so air conditioning (even though I would love it) would not work for us. The remarks you make about insulating the outside is interesting, as every inch inside is valuable. What would you use between the timbers?? Just for your information we currently have a catering trailer which is made of 18mm insulated GRP panels. This is 10 years old and we don’t freeze in the winter or overheat in the summer and condensation is not a problem as whilst cooking the hatch (10ft long) is open. What worries me is the steel from the container?? What you propose here would be a bad idea. You are basically allowing warm moist air (think cooking) from the interior to enter behind the paneling and condense on the cooler steel container walls. While water vapor in the air will pass easily behind the walls, once it condenses it will form puddles on the floor that will take much longer to evaporate. I don’t think it matters so much what type of insulation you would use on the outside so long as it’s properly applied. Spray foam would still be the best as it is more space efficient than virtually anything else – you could probably get by with 2×2 furring strips. If you use fiberglass, you will basically have to build 2×4 or 2×6 frame walls and a roof on the outside of the container which almost makes using the container moot. 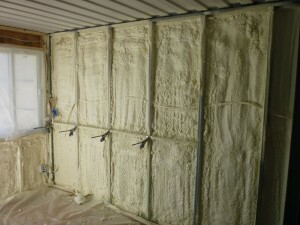 Nothing beats spray foam insulation for shipping containers. I am responding to the point where you say “Something I would consider if I were to do it again would be a hybrid approach with both foam boards and DIY spray foam. Glue as much 2″ foam board as possible to the walls at just $0.60/sq ft, and then spray foam the seams, corners, and edges to seal everything up. As long as the all the seams are sealed, water vapor should not get behind the foam to the colder steel walls. ” and later you refer to ‘insofast” an say that “As a rigid and flat product, there will naturally be an air space between it and the exterior container wall – remember that container walls are corrugated. Any crack, hole, or other opening through this product would allow moisture laden warm air to enter into that air space. This moist air would eventually condense on the cold steel walls and form puddles behind the insulating panel.” My question is since 2″ form board is ridge, how would you suggest not recreating the spaces and condensation that insofast would? Thanks. PS! Your Blog is very helpful. I appreciate all your help. One more thing… What do you think of Prodex total insulation 48? Interesting stuff, but I have a real hard time believing a 5mm (13/16″) flexible sheet can have an R-value of R16. They’re basically saying that their 13/16″ flexible sheet has more insulative value than a full 3″ of extruded polystyrene foam. If something sounds too good to be true, it usually is. Even if this was good insulation, it probably still wouldn’t work too well. Where it would fail is on all the nooks and crannies and odd angles present around the perimeter of the container wall. If you could apply this to the corrugations, and if you could seal the seams, and if you could then spray foam around the edges and into the nooks and crannies, then it guess it might work. I wouldn’t personally take that chance though. The Insofast system is an insulated panel with integrated attachment studs for drywall. As it’s designed, the system would need to be installed as a vertical plane against the corrugated walls. This would create a significant air space behind approximately 50% of the insulated panel. What I was proposing would involve cutting the rigid EPS panels to a width that would fit within, and on top of the corrugations. The panels for the externally protruding corrugations would have their edges angle cut to fit precisely within the corrugation. The panels for the internally protruding corrugations would either but up against, or be over sized to overlap the other panels. The panels would also be glued into place for support, and so that there would be virtually no air space behind them. Spray foaming the edges should then lock everything into place while also theoretically creating a seamless barrier. While this would be time consuming, it would also save a considerable amount of money. 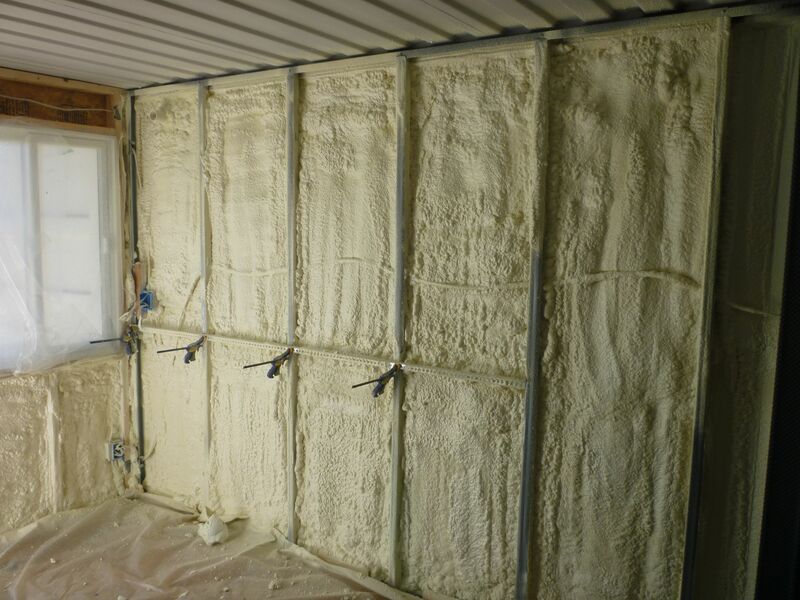 I do think a complete closed cell spray foam job is the best for shipping container insulation, but if you don’t have the money for it, this hybrid approach would probably be the best alternative. Excellent site Steve. I am embarking on a cottage project, built from seven 20′ one trippers, and I am at the debate stage with my designer (I’m getting building permits) about insulation strategy. I’m in Ontario Canada. I am a big fan of the raw container look, inside and out. I really like the idea of using a ceramic coating on the inside walls and ceiling as my sole source of insulation (no studding, no cavities, no loss of space, no drywall), and spray foam the underside of the plywood floors. I see your link to the Mascoat Industrial Anti-Condensation Insulation. I concur with the comment about ceramic paint suppliers seeming sketchy (except Mascoat as an example). I have just sent a note to Mascoat to get more information and to discuss my application with their experts. I am heating my place with free fire wood and only use the place one weekend per month, so I don’t need R20-walls or R50-ceiling insulation performance like typical building code in my area. I might be trying too hard for the holy grail insulation solution, but I will be searching high and low over the next couple weeks to find a ceramic coating solution worth spending the money on (and taking the risk on). Any leads or additional thoughts on this topic would be helpful. I will repost what I decide to do, and hope to start a website for my project as well to share my project experience with others. As for the Mascoat, I’d be wary using it in an application such as yours. I had only considered it as an adjunct to my external ceiling insulation if it was found to be wanting – fortunately it wasn’t. Mascoat’s not cheap, not easy to apply, and you’d probably need several layers to provide even a minimal amount of insulation. When building a shipping container home or cabin, the old adage of there’s no such thing as a free lunch applies. Good luck, and keep me informed. Subfloor- damp proof barrier on ground(say concreters black poly) and 100-200 mm rock wool. Similarly, rock wool on a chicken wire mesh can be used to raise the insulation where stumps are high. Ceiling- batten the container roof on both inside and outside. On inside, rock wool insulation on plasterboard. Any condemnation on tin will drop onto the rock wool and dry. This is similar to the standard tin roofing construction. On the outside, paint the roof with damp proof paint or put down black poly with rockwool on top. I’m having a hard time responding to your question since I’m not at all familiar with your climate, and I’m wary of recommending anything other than spray foam insulation. In regards to the subfloor, are the containers going to be on the ground or raised. If they’re on the ground, a vapor barrier of some sort could be useful. Insulation may also not be necessary in your mild/cool climate considering the container’s 1 1/2″ marine plywood floor – especially if it’s on the ground. My cabin only has 1″ of spray foam underneath the elevated containers, and I have felt comfortable in temperatures down to -10F. Does the damp proof paint you’re considering for the walls prevent moisture from forming, or is it just resistant to it? If it’s the later, you’ll still have a problem with moisture forming behind the drywall. As I’ve mentioned before, you can try to install a vapor barrier to prevent moisture from getting behind the wall, but it would need to be absolutely perfect everywhere to work correctly. Your ceiling comment scares me as you’re already planning for condensation to form. You also assume that it will be able to dry out somehow. Something I’ve found in working with containers is that water vapor has nowhere to go in a closed container. Most traditional houses have some level of air leakage that can deal with a small amount of water vapor, but a closed container does not. I guess if your container is always open and ventilated this might not be a problem. I’m sorry to be on the negative side with this reply, but I’m going to stick to my recommendation of only spray foam insulation. Thanks for creating this forum, very helpful. The most space-efficient AND energy efficient method seems to be to tack-weld furring strips on the interior walls -horizontally. Then closed-cell spray foam. The foam should be able to get behind and inside the furring strips. But because the furring strips are horizontal, whatever panels you’re screwing to them would normally be oriented vertically, i.e. with vertical seams. Okay for drywall, because you’re taping the seams, maybe not so pleasing if your panels are plywood. This is just an aesthetic thing – vertical seams throw me off. As for the ceiling, since closed-cell foam is paintable, why not plan for minimal framing in the ceiling, spray-foam it, and paint the foam? I don’t need a drywall ceiling. I only need a strip of framing down the centre in case I want to mount a light fixture or something. The problem you’ve pointed out with flat panel insulation being glued to the interior walls is correct – the spaces in the corrugations behind the panels would be problematic. Here is the hybrid solution for the do-it-yourselfer: spray-foam the cavity portions of the corrugations, use your knife or saw to slice off the excess, and then glue the rigid panels. While it may seem finicky and time-consuming, it would use much less spray foam than a normal complete 2″ coating, and the rigid insulation panels are a nice surface to glue your finishing panels (drywall, plywood, whatever) to. You thought I was never going to pose a question – here it is. If I put minimal framing in my ceiling and then put a 2″ closed cell foam on it, what do you think would happen if I walked on the roof? Would the flexing damage the seal of the foam? I really like your hybrid idea of filling in the protruding corrugations with spray foam then using flat panels on top of that. The only problem I see is finding a secure way to attach drywall or paneling to it – I’m not sure I would trust glue exclusively to hold my drywall in place. What about vertical studs spaced to be directly over the spray foamed corrugations with foam panels in between? I’ll have to give this some more thought. The bad news is that I’m going to have to nix your ceiling idea. I looked into the same thing myself, and interior spray foam needs to be covered by a fire barrier. The International Building Code requires foam insulation to be separated from the interior of a building by an approved thermal/fire barrier of 1/2-inch gypsum wallboard or equivalent. In regards to your ceiling question, I’m not sure what would happen. I know that my container roof with 2″ of spray foam on the outside doesn’t flex when I walk on it, although it did beforehand. Steve, you went with a single 2 inch application, for R-15. Now, granted, you are using this for a hunting cabin, so winter occupancy is limited. You do not, so far as i can see, give a location, which would help a great deal. I am currently planning out a single 40 foot container for full-time residential use. it must be able to go anywhere in the USA, so I think R30 is called for. Is there any conceivable problem or benefit to going 2 inches inside and 2 inches outside to get R-30? Due to shipping constraints, I’d REALLY rather not mess with the exterior at all (I dont know if being another 6 inches wider makes a different re: putting it on a semi for shipment elsewhere) but given interior constraints, I do not have much choice. Last question. Homes need breathability. Shipping containers seal up water tight – meaning air tight. How does one add breathability without losing the ability to seal up water tight – all the while maintaining a controllable temperature? Nearest thing I can think of is small vents floor and/or ceiling with a double sided rubber plug drawn together by a bolt to seal the vent when needed or desired. My cabin is in northern Wisconsin, so it can get plenty cold here. I’ve been in the cabin when it was -10F outside, and was very comfortable with just my Jotul 602 stove. I feel my stove could easily keep the cabin warm even in -25F weather if necessary – if it was any colder than that I’m not sure why I’d be there in the first place. Something else to consider is the type of heat you have planned for your cabin. Since I have a wood stove, the cost of firewood in northern Wisconsin is dirt cheap. I’m not sure I’d ever get a return on my insulation investment if I used more than 2″ of insulation. I also believe that wood stoves should be run at hotter temperatures to prevent creosote buildup, so too much insulation or too big a wood stove can actually be a problem. I’m not a fan of spray foam insulation on the outside of cabins, although there can be some advantages to that for some people. While my walls only had 2″ of spray foam, I think I could have gotten another inch sprayed on them without moving the walls inward any. I can’t imagine ever wanting more than 3″ of spray foam, especially considering how air tight and thermally isolated the walls of my cabin are. I’m still working through the whole ventilation thing with my cabin. For now, I’ve been doing it the old fashioned way by opening windows – even in winter. I plan to add a powered vent to the bathroom someday, but I haven’t had any problems so far. I do have two passive vents at the front left and rear right of the cabin that are original to the containers, and those do help some. just thinking about this– agree spray on closed cell would be the best– like the idea of spraying on the outside for the ceiling and the floor- and doing insulation on the inside. with a covering of thin drywall on the walls and keeping the metal ceiling… my other hmmm thought is you could run the electrical possibly in conduit on the top of the container and possibly the pex for the water supply. Then over the top spray six inches of closed foam insulation and then use a spray on roofing membrane. to protect the foam. You might be able to use the rigid foam board to make foam rafters/ridgeline shaped to the final roof slope -think like ribs- then just fill in between the ribs with the spray foam insulation.- You might need to do some carving of the foam to get it to look pretty. The warm air would go towards the ceiling- and if the water pipes were right on the metal I do not think it would be any worse then being inside a wall in the wintertime. The one thing you would really need a spray foam guy you could trust- ran across a company that sprays insulation and sprays the roof coatings. 1. Electrical and water on the roof. I guess it could be done, but I don’t see a good reason for it. Even with my 1.5″ steel studs there’s more than enough room for electrical conduit and PEX. I also don’t like drilling a lot of holes through a perfectly good container roof. 2. Spray foam roof with spray membrane. While it would probably work, the better and cheaper route would be to use the standard methodology of rigid foam boards and a sheet membrane. I looked into this for my cabin but eventually decided on a more traditional appearance for my roof. 3. Rigid foam board pressed into spray foam. The biggest problem here would be the extra time and precision necessary to get everything level. Spray foam within studs is nice in that it’s easy to trim the expanded foam away leaving everything even with the studs. I’d also hate having my drywall glued to the insulation in case I ever needed to remove or repair a panel. There are so many advantages to having studs, such as support for electrical conduit and boxes, substrate for drywall, and support for kitchen cabinets, that I don’t think I’d like to eliminate them. 4. Insulating the outside of containers is commonly done. It has several advantages such as greater interior space, more traditional siding options, and insulation options other than spray foam. One question, the containers I’m looking at are ventirrated (2 – 4 small vents in the corrugated walls near the ceiling). Everyone I talk with says that’s the standard. If that’s true, it seems rike a bad idea to seal them off with closed cell foam. What’s your thinking here? Thank you so very mulch! My containers, and all others I have seen, also have the vents. I did not cover mine up as I wanted to have a small amount of ventilation even when the cabin is closed up. What I did was epoxy a short length of 2 1/2″ PVC pipe to the inside of the container wall directly over the vents. The PVC pipe now extends about 1 1/2″ past the finished drywall. The nice thing about the pipe is that I can easily attach different accessories to the vents. I have some caps that I can plug up the vents if I want to, although I’ve never felt the need to use those. Right now I’m using PVC couplings with finer insect screen to keep out some small flies I had get in the cabin last year. The insect screen that comes installed on the container vents is somewhat large and seems to allow very small insects to pass through. I’ve even thought about attaching a small computer fan to one of the pipes for some mechanical ventilation, but I usually just open a window when I need some more air. Hi, I am about to embark on building my ‘weekender’ from shipping containers, given my climate (Central Victoria, Australia from minus 6c – +40 c ) and being near a road, I have decided on using a 3mm foil based thermacoustic underlay glued to the walls and ceiling, with 3mm wood paneling. A hell of a lot cheaper than spray-on and saves internal space. I’m probably too late to this thread to expect a reply, but I’m very interested in how this method worked out for you..
I’m close to starting on my own container dwelling in NSW and would be keen to get some more details from you about what you did. Would you comment on your top 3-5 ways in how you would go about insulating from the outside of a container opposed to inside. I would assume spray-foaming an entire container would be your preferred method. I had researched aspect so the dangers of spray foam when they don’t mix perfectly and leave toxic gases behind. I would prefer to spray on the outside, but would appreciate your view on the different outside options so that mould and moisture are eliminated. If I was going to insulate on the outside, I would still use closed cell spray foam. You will first need to attach an appropriate framing system to the outside though, before the spray foam, so you can attach whatever siding you choose. While there are some advantages to insulating on the outside, such as increased interior space and a more traditional exterior appearance, I think it defeats one of the main advantages of shipping containers. That advantage is the structural ruggedness and low maintenance of the shipping container steel. It also creates a corrugated interior surface, if you leave it bare, that would make finish work and decorating difficult. If you still choose to drywall the interior, you are creating much more work than is necessary with containers. Steve, me and my family are looking into building a container home out of 6x40ft containers in lots of 3 with a traditional framed room in between the two 40ft container blocks. Could u get away with only insulating the interior walls that are the exterior walls? And what method did you use to attach your timbers to the container walls and ceiling if i was going to line it from the inside?I was thinking a metal tab welded to container that timber can be screwed to. Also i have read/seen people put a simple framed roof on top to transfer direct heat away from container and create a cavity as such. With that method could heat transfer kits be used to transport warm/cool air around the home. And allow future provisions to be added later down the track such as electrical or water. Your first question is a difficult one, and a lot probably depends on where you are building. In extremely cold climates I would be worried that the metal could transfer enough heat away from the interior walls that you could get some condensation on those. I had a minor issue related to that before I finally got around to sealing up the exterior gaps between containers. I have seen some container buildings with walls that pass between inside and outside spaces, so it must be possible – it’s just that I wouldn’t do it where I am located. The only “timbers” that are in my cabin are the fake beams that I constructed by covering the container box beam remnants with some 1″x6″ cedar boards. these are attached with self threading screws to the steel box beams that are underneath. A metal tab welded to the ceiling would work very well to attach what you’re talking about. In regards to your roof cavity idea, I’m not quite sure what you’re trying to accomplish. I do know that my roof does an almost unbelievable job keeping my cabin cool on the hottest summer days. The combination of spray foam on top of my containers, and a galvanized metal roof with excellent ventilation below, limits almost all heat transfer to my containers. Hello, thank you for great blog! I am in planning phase of my container home and so far the insulation is my biggest concern. I live in NE Europe(Estonia) and we got at least three months winter weather. Secondly our government requires to build houses with minimum U value which is 0.25. As i understand the closed cell spray foam insulation is the only option, but it is expensive. I have planned two story house by using 4 20ft and 4 40ft containers. For U value 0.25 i need approx 4 inch of spray foam and it would cost a fortune for 144 square meter home. What do you think combining foam and regular mineral wool insulation. I consider 2 inch foam and 3 inch wool to achieve that or 1 inch and 4 inch. What do you think of combining foam and wool? I think what you are proposing should work. Something you will need to research first though is the depth of closed cell foam that is required to create an effective vapor barrier – I have heard that 2 inches is the minimum. And just to be sure, the foam would be sprayed on the steel walls of the container interior and the mineral wool would placed be on top of that. Great ideas for your climate, but what about nevada? You might be able to do things differently since you’re in Nevada, but maybe not. It all comes down to whether or not you will ever have warm, humid air inside and colder air outside. This is what will cause condensation on the interior walls of a shipping container. If you’re sure you’ll never have high humidity on the inside, from say a shower, you could probably use whatever insulation you’d like. I might even omit a vapor barrier entirely if I was using a non-foam insulation in an arid environment like Nevada. Since shipping containers have a perfect vapor barrier on the outside, an additional vapor barrier on the inside could permanently trap any moisture that finds its way into the wall. Omitting the interior vapor barrier in a dry climate would allow any trapped moisture the opportunity to evaporate to the interior space. Interior vapor barriers work best when the outer wall is semi-permeable – much like the traditional plywood, tar paper, and lap siding walls used for decades in the US. In the end though, nothing will provide as much certainty as closed cell spray foam insulation. Hi there! I’m looking to build my first home (and perhaps my only home) out of shipping containers, and insulation is one of my primary concerns, as much for keeping heat in as noise-proofing. After reading about how important it is to prevent condensation, I’m starting to worry about my climate. I live in the pacific northwest, and it rains constantly and rarely breaks 50 F. I understand that spray-foam is the direction to go, but I’m curious if the 2 inches-worth you recommended is going to be all I’ll need, or if I’ll need to add more on the outside as well. This is going to be a 1500-1800 square foot build, so the last thing I need is my home to rust out from underneath me. Also, how do containers handle sound after insulation is put in? Our island is near an airforce base, and the noise pollution is ridiculous. Where we live now, we regularly hit 100 dB when the jets fly over. : ( We can’t speak to each other when they fly, so having some quiet would be nice. 2 inches of closed cell spray foam is considered the minimum for an effective vapor barrier. Anything more than that is dependent on a more complicated cost/benefit analysis of your heating needs. I chose a minimum of 2″ and it has kept me warm down to -10F. If this was my permanent home I would probably have used 3-4″ to save on energy costs. As it is, I’m not at my cabin that much in the dead of winter, and I also heat with wood which is very cheap in my area. I also wouldn’t insulate on both the inside and outside – better to just pick a side and put it all there. It’s interesting that you bring up sound insulation as I had an experience that might make you reconsider building with containers. A town a few miles away was having a fireworks display that I wasn’t aware of. Inside the cabin there was a strong low frequency vibration that felt as if it was coming from under the cabin. When I went outside to check, I realized it was some local fireworks that was causing it. It seemed as if my containers were amplifying the noise. Normal everyday sounds, including even gunshots during hunting season, don’t seem to be any louder within my cabin. I think it was the extraordinary loud booms of certain fireworks that are accentuated. Because of this, I would personally be very wary of using containers with military jets flying overhead. With insulation being one of the bigger issues, why not buy a refrigerated container with R31? There are several reasons not to use refrigerated containers. 1. Removing adjoining walls for a larger structure. My side walls were removed with cutting torches. Others others have used grinders or plasma cutters. Each of these methods will generate a considerable amount of heat that could ignite the spray foam insulation. 2. Cost. New one-trip insulated containers cost much more than non-insulated containers. They are also harder to find. A quick search of eBay turned up zero insulated containers for sale. 3. Lack of structural framing. Most interior finishes, such as wallboard, are designed to attach to some sort of framing member. I’m just not sure how one would go about finishing one of these to look like a real building inside. 4. Wiring. You would probably be relegated to exposed wiring throughout the building. I wanted my containers to look like a real cabin on the inside. Firstly, excellent job allround, on your design, construction and documentation of your build! truly amazing and huuuge help to people looking into container homes! ive been looking into container homes for the last few years but am only just considering actually doing it. my location of choice is in the tropical cook islands.. so my first question is.. do i still need to insulate? it seldom gets below 17 degrees celcius? and lastly, im thinking of framing in timber, and lining with GIB plasterboard but did you put any vertical fixing in of your studs to the contsiner wall? i know you fixed your top and bottom plates to container and your vertical studs to top and bottom plates but did you put any additional fixing in across that vertical span? many thanks and again congrats on an excellent build and superb blog for all to see and acquire knowledge from. The Cook Islands sound nice, especially this time of year in Wisconsin. If I was in your situation, I might consider omitting the insulation. I don’t know if it would ever get cold enough for any moisture in the air to condense on the walls. Do you ever find dew on buildings or other things in the morning? if so, you still have might have to worry about condensation on the interior walls. I did not add any additional vertical fixing to my studs. Most of my metal studs were “glued” into place with the spray foam, but for the ones that weren’t I wish I had. As I mentioned in my framing post, if I were to do it again I would have used wood studs which would have provided all the extra support I would ever need. Hi, firstly thanks for such an informative site. I too have been considering container home for some years and about to proceed in near future with 2 storey 5x 40′ and 6 x 20′. Temp here ranges 15 to 35C. Considering lining most external walls with anticonvulsant roofing blanket ( foil and fibre glass wool) and zincalume colorbond corrugated sheeting attached to vertical timber studs. Internally using light weight galvanised pre drilled (for plumbing and electrical) with standard fibreglass insulation and Gyprock or timber panelling. Do you see any problems with this method, apart from the added expense to line both sides of container? Also I haven’ t purchased the containers yet but obviously concerned about chemicals used on flooring. I was thinking to pressure clean and apply a rubberised coating before pouring 4″ concrete. I note you said earlier that concrete is not a perfect vapour barrier, but I’m not keen to remove all the flooring sheets. Finally, the lower level of containers will all have airflow space between floor and ground, would you recommend coating them if they are not rusted, also any suggestions on insulating and or preventing chemical vapour between top and bottom level containers? Heaps of questions but greatly appreciate any advice. Regards Grahame. Let’s see if I can answer some of your questions. 1. I don’t see a problem with insulating the exterior as you state, although it seems a waste to cover one of the greatest benefits of a Corten steel container. 2. As I have mentioned before, I wouldn’t use metal studs if I had to do it again. In my opinion, they aren’t as strong as wood studs, are more difficult to attach things to (i.e. upper kitchen cabinets), and take longer to erect than wood. 3. Rubberized coatings and concrete are not effective vapor barriers. That being said, depending on the treatment chemicals it may not really matter. I would always be more comfortable with at least a couple of coats of epoxy – it shouldn’t cost that much and is pretty quick to apply. 4. The underside of my containers came with a waterproof coating already applied. If they didn’t, I would probably want something to prevent water vapor from the ground working it’s way into the exposed wood. A lot depends on your climate – do you trend wetter or drier where you are? 5. As for insulating and preventing chemical vapor transport between stories, I have no clue. One of the problems, unfortunately, with spray foam insulation is the toxicity. Many people who read more about the off-gassing will choose not to use it. It seems the biggest problem is finding proper non-toxic insulation for shipping container homes. Frustrating! Great link, and it is definitely something to consider. I remember when my insulator spray foamed my containers and told me that he recommended to his clients to stay out of their homes for 48 hours after the application. I can honestly tell you that I wouldn’t have wanted to stay in my cabin even a month later – there was a huge amount of chemical off-gassing during that time. Some of that could also have been due to my cabin having very little ventilation when it’s closed up so it had nowhere to go at the time. It eventually does all off-gas, but I’m sure there are some people who are more sensitive to the miniscule amounts that remain than others. I pondered the same thng you did regarding interior height and insulation. I bought my first pair of containers never knowing what an “HC” was, used them for storage, like most people. I got involved shipping cars to Europe and the first shipment I did the shipping company delivered a 40’HC container….9’6″ height! I called my supplier asking if they were available, and indeed they were at the same or even slightly LESS than standard 40′ containers! I’ve not bought a standard container since, usually a 45’HC now, where I can frame with 8′ timbers a standard wall, and make any type of drop-ceiling I desire at whatever height I desire. It’s the old sayng “if I not knew this when bought my first set!” I’m preparing to make a home here in The Philippines, having spent most of the last 8 years working remote jobsites where everything is container construction, from our 20′ self-contained rooms, to the dining halls. Thanks much for the great website, very informative, picked up a few good ideas along the way browsing the pages. I had looked into high cube containers when I built my cabin and they were much more expensive and very uncommon. If I was building a full time house I probably would have gone through the trouble and extra expense to use them. Since I was building just a cabin, I think 8′ ceilings are more than adequate. I’m also not a fan of dropped ceilings as that seems to be the place mice and other pests like to hide out if they get into a building – at least in my part of the world. This is the site i’ve been looking for. I’m looking at building a permanent, off grid, residence out of 1-40′ sea can. Biggest concern is insulation as well. I live in Nova Scotia, Canada, so cold temp is half the year. I was considering 2″ of closed cell spray foam on the outside, but here’s the catch. I was thinking of spraying it so it was finished level, and then sanded to a nice finish and painted. I was also thinking the mesh and stucco on the outside of the foam, but i think it’s too pricey. SO, painting foam, what do you think of that? and do you think it could be sanded to a decent finish or will it still be bubbly and little pockets everywhere? I figured this would save framing up a wall on the outside, and putting on siding, maybe saving a pile of money. I Just have to figure out how to mount 8 solar panels on the roof with spray foam. I may just put them on the ground. Unfortunately there’s no way to apply spray foam insulation and have it be “finished level”. The nice pics you see with level spray foam between the studs is that way because the extra was cut down even with the studs. I also wouldn’t trust paint, or any other coating for that matter, to adhere to and protect the spray foam over the long term (i.e. 20+ years). If I was going to spray foam the outside, I would bite the bullet and add framing and then side it afterwards. In my opinion though, you are giving up one of the greatest benefits of a shipping container by siding the outside – a nearly maintenance free exterior that will last 100+ years. If you side it with cement board siding you should still end up with a nearly maintenance free exterior that will last at least for generations and you have added rather than taken away from the usable SF. Insulating and siding on the outside does have some advantages, especially if you like a more traditional exterior appearance and don’t mind corrugated interior metal walls. The thing I would miss the most is being able to drill into and mount things to the drywall and studs. I’m still not sold on cement board siding though. I have some of the James Hardie lap on my primary home and don’t really like it as much as I thought I would. When researching siding for the exposed front of my cabin, I decided to use LP SmartSide lap. From what I read, it seems to be a much better product than cement board in many cases. It’s also way easier to install too. Hi! I am new to your site here. Like reading all the comments and thoughts along with your log. I am putting together in a couple of months a container home. I was looking at this for insulating. Has anyone looked at this? If so, what are your thoughts? I have mentioned it before, but it’s worth repeating. Insulating paints, with or without ceramics, do not work. Read the links below for more information. And if all you’re trying to do is reflect the sun to reduce solar heat gain, plain old white paint works just as well. I dig all the sage advice you have been dealing out. Now I know your stance on insulating the exterior of shipping containers, but I wanted to know if you have seen anyone use SIPs to do so? I have years to perfect my idea for a container home, but so far the idea is three containers and timber framed roof and walls to complete the structure. So far I haven’t found anyone who has tried this….maybe I’m looking in the wrong places. Again I appreciate your site and all the advice and putting up with all our questions. I have not seen anyone use SIPs for insulation on containers, but I’m sure it could be done. The problem with using SIPs is that of economic and structural inefficiencies. A SIP is a structural insulated panel, and as such it has enough structural strength to be used by itself. Attaching a SIP to the outside of a container may very well insulate it, but it will also provide a duplicate and unnecessary structural support for the containers. You will essentially be paying twice for the structural framework of your home, and making the containers a VERY expensive interior wall covering. Unless you need the security and protection a container offers, you’d be better off building with SIPs alone. You could then add inexpensive corrugated steel panels to the outside and/or inside for the architectural look you want. 1. It’s not so much the insulation that keeps condensation out, it’s the vapor barrier. Two inches of spray foam insulation will also serve as a vapor barrier, but it’s very expensive for just that purpose. My containers were all sprayed at the factory with some type of bitumen undercoating, which probably acts as a basic vapor barrier – for water vapor at least. 2a. If you read my “Interior Framing” post, you’ll see where I installed 1/2 foam sheathing between the stud wall top plate and the upper box beam of the container. I feel this is mandatory for steel studs due to their strong thermal bridging. It’s probably less necessary for wood studs, but the cost and time are so little that you might as well err on the side of caution. 2b. You will also see in my “Interior Framing” post how the stud walls are offset from the container at least an inch. I was VERY careful to have not even a single steel stud contact the container walls. They were only affixed to the wood floor on the bottom and had the foam insulation between them at the top. 2c. I don’t know why you would want to spray the insulation twice. Just build the stud wall and spray it once. The insulation will get behind the studs just fine, and it will create the strongest wall you can imagine. It’s like the studs are glued to the container walls. 2d. “Airing out” a structure has more to do with air exchange than circulation from heating or cooling. Keeping your windows open as much and as long as possible will work better than anything else. I have a company that recycles shipping container and converts them into hydroponic farms for the food industry. My main concern was maximizing interior width while still having supportive walls. I researched enough and chose your method as the best option. I framed out the walls and ceiling (in my case). Got a spray foam guy to come out and spray. Had to send him back because he was concerned spraying in the foam would twist, bow, and deform the studs. I agreed with him and that further planning needed to be done involving reinforcing the studs somehow. I know you had problems with spray foaming. Can you tell me if you had problems related to mine and how you solved them or any recommendations on what I should do? Thanks! If you look at the picture associated with this post you will see a horizontal bar clamped across four of the metal studs. My insulator did this to prevent the studs from bowing out as the foam expanded. I wasn’t there when he was spraying, but I would guess that he had to spray just one section at a time and wait for it to expand to prevent outward pressure from all the studs at once. It must have worked since I only had one small section in my cabin that showed some bowing. As I mentioned in another post, if I had to do it over again I would probably use 2×3 wood studs. I feel the extra 2 inches I gained using the steel studs wasn’t worth the extra time and trouble. Hi, this is susie from sw france, again, with another question for you. I’m still going with the greenroofshelter kind of idea, on a twenty foot container, although probably not as ‘cut out’ as much as the ones on the pictured site. I’m still going for using a flatrack container on top of an ordinary container, with the flatrack being used as the support base of the living green roof ( still mulling the insulation between the roof and the flatrack). Containers aren’t exactly the norm in my little village, so I’ve been told that I will need to disguise the exterior. It’ss already very lucky to be allowed containers at all, and I’m only allowed a flat green living roof for political reasons. Most of the centuries-old stone houses in the area are covered in a kind of cementy stuff and left unpainted and gray for centuries. I have seen one sixties ‘modern’ house with styrofoam sheets screwed directly onto the exterior walls, leaving a gap of an inch or so from the ground, then lightly scraped over with stucco and painted (actually, the difference in the winter warmth and summer coolness of that house was amazing after the work). Would it be possible to cover closed cell foam with cob, or stucco, or styrofoam sheets, or would it either not stick or simply be double the effort/cost? The house has to look ‘local’, with perhaps even some decorative open beam or brickwork or stone framework, in order to please them that rule. Sort of a ‘correct’ version of a hobbit house would probably pass, so any not-too-mocking ideas would be most welcome. Susie, how did you resolve your issue? I am in Houston, Texas and wanting to do something similar to what you are describing. Could you please comment on your choice of closed cell foam? Isn’t it possible that a small amount of water will collect at the metal/foam membrane? after a while this might be a problem? Properly applied (>2″) closed cell spray foam insulation is the only insulation I am aware of that will completely prevent condensation from forming on the interior of a container metal wall. It does this by not only acting as insulation, but also as a seamless vapor barrier. BTW, open cell insulation does not have this characteristic. While you could theoretically protect the wall with a polyethylene sheet as a vapor barrier, any imperfection or or damage would cause it to fail and allow water vapor to contact cold metal and condense. While it’s possible to damage closed cell spray foam insulation so that it fails, it’s also highly unlikely. Even if you did, condensation would only form on the small area that was damaged. The spray foam on my walls is so tightly adhered, it’s like glue and is very difficult to remove. On the other hand, imagine a puncture or tear in a poly vapor barrier. Water vapor could easily enter into the wall cavity and condense on countless square feet of cold metal walls causing much more damage. Thanks for putting up this information for free. I have some questions if you don’t mind. I live in West Africa and temperature is usually within the 25-37degrees range (No winter, lots of rain usually hot and humid). What kind of insulation would you suggest? I need something that can keep the inside cool as I intend to cook and bake in it. In regards to insulation, there’s not much I can help you with as I don’t have any experience with your climate. The best suggestion I can give you though is to protect as much of the container as possible from direct sunlight. Containers can heat up very quickly in direct sunlight, and while insulation will help, it’s best not to heat it up in the first place. I have seen the InSoFast panels, and am intrigued, but I’m not entirely sold on them yet. I still think it’s possible for water vapor to work it’s way behind the panels and condense on the steel walls. Until I get my hands on some to test, or find an independent review somewhere, I will have to remain skeptical. There are a lot of places you can economize on a shipping container build, but I feel strongly that the choice of insulation should not be one of them. Two inches of closed cell spray foam insulation is the ONLY insulation that will positively prevent condensation behind the walls. Hi Steve, I am a long ways into building a container cabin and have decided to use the hybrid method on the interior walls. I am curious as to the need for closed cell foam on the outside ceiling. I am thinking of using a blow in insulation on the the ceiling, as it is under roof. So I would be blowing insulation on the outside of the container roof. What are your thoughts, please. Also, I am guessing you have had no condensation issues on your ceiling in the cold weather? As long as you insulate OUTSIDE the container, you can use any insulation you want. Spray foam, foam panels, fiberglass, and even straw bales will work just fine. The only reason I had mine spray foamed is because I already had the guy there to do the walls and underside. With the proper roof, I think blown in insulation would be just fine. In regards to condensation on my ceiling, I have had absolutely none. It’s funny because one of the contractors I had there doing something else told me water would be dripping from the ceiling in the winter. Five winters so far and it’s been perfect. Great post. How is the house still holding up, 5 or so years later? In a few years, I plan on building a shipping container home. I plan on using 2×4’s for the internal walls, and also for the interior ceiling, as well as under the floor. I also plan on using spray foam insulation (closed foam) for the interior walls and ceilings, I plan on leaving the external walls of the shipping container exposed to the elements. The house will be build in South east Alabama, where it is humid a good part of the year, and the highs during the summer are in the mid 90’s, and the winter lows are in the mid to upper 30’s. I’m most concerned about condensation building up between the insulation and the steel roof, or the insulation and the dry wall I plan on installing. Do you see a flaw with this design? what do you recommend? Everything is holding up great so far, and I haven’t seen any condensation on the walls or ceiling. The extra cost of the spray foam insulation has been worth the peace of mind. With 2×4’s on both the ceiling and floor are you worries about the lack of height in your container? I did everything I could to maximize the interior height of my cabin since I’m 6’2″. Maybe you should consider buying 9′ high cube containers to help. I think it’s wise to insulate on the inside and leave the container walls exposed to the elements. The thick steel of the container walls make an excellent siding that should last many lifetimes. And as long as you spray the insulation directly on the inside steel, and apply a minimum of 2″, you will have a seamless and continuous vapor barrier that will prevent any condensation from forming. I do not plan on using 2×4 under the floor, but do plan on spraying foam insulation on the underside of the shipping container floor. That’s exactly what I did and it does work well. I only used 1″ spray foam underneath, and even in temperatures of -10F I haven’t felt the need for any more. My 1″ of spray foam, 1-1/2″ of marine plywood, 1/2″ foam board, 1/2″ OSB, and laminate flooring seems to provide enough insulation for the floor. Thanks for the response. One more question. Do you see a problem (with condensation) with installing insulation and then sheet rock on the interior of the roof of the shipping container? As long as it’s 2″ of closed cell spray foam insulation you should have no problems. Please keep in mind that since the spray foam itself is the vapor barrier, you do not want to add an additional vapor barrier such as poly sheeting or a vapor barrier primer/paint. Moisture always needs a way out of a wall cavity. Since the container wall and spray foam is the impermeable side of the wall cavity, the interior drywall side needs to be permeable. I love this article. It’s like a big think tank in here. Lol. Great reading. Hats off to all the innovation, research and hard work. Great site! I am getting ready to build a shipping container home in Houston, Texas and your site has been extremely useful in my years of planning. Insulation is still my biggest concern, mostly for city code reasons. After reading everything I am thinking that I am going to go with closed cell foam on the outside to keep neighbors from complaining about the appearance. I am thinking it could have an adobe look. Sounds like your roof is holding up. Any ideas on longevity and maintenance. why not use a refer container, its already insulated. For my insulation solution, I thought I could cut out the inside walls of two side-by-side shipping containers. Then use the sides I cut out from the inside and use spacers to install them about 4″ away from the outside walls. Seal the bottom and sides by welding some sheet metal, and once the bottom and sides are sealed, blow in insulation and cap off the top to create a hermetic seal. With this solution, do you think I would still need a vapor barrier on the walls? Any other potential issues? If you are talking about insulating the outside of the container, then no, you would not need a vapor barrier. You could even do this on the inside, but your vapor barrier would need to be perfect, without any flaws, for it to work. Even a small break or flaw in a vapor barrier will allow moisture laden air to enter and eventually condense on the colder metal walls. And in your scenario, if it did, I can’t imagine the trouble you’d have to go through to open up the walls and fix it. Most traditional homes can deal with a small amount of moisture getting through a vapor barrier. This is because the outer sheathing of a wall, such as plywood, typically has some degree of permeability to it. Shipping container walls have ZERO permeability to water vapor. Ventilation should be a concern in a very sealed environment. But there are solutions. There are many kinds of air/air heat exchangers available. Any home that is built really tight (I live in one) should have one installed. I’ve even seen DIY exchangers for the very handy. The level of sophistication varies and can involve humidity control also. PS – Really enjoy running across your site. Very informative. I have looked at and considered air exchangers before, but my biggest problem is with their energy requirements. Being off grid, and with just a small solar system, I don’t have the power necessary to support one. Instead I just use the old fashioned method of having a window partially open all the time – even in winter. I did retain two of the original container vents, and those are always left open. They are only a few inches in diameter, so they really don’t offer to much in the way of ventilation. My guess is they were originally provided for pressure equalization during transport. Im new to all this so simple instructions would be much appreciated. Ive bought a 20ft shipping container with two pvc windows and a door installed, and my question is about insulation. My questions are..in what order do i place the different layers/items. I have bought battens to build a frame, but not sure how to do it. Do i attach the battens to the container wall directly or do i leave a gap between the wall and battens? Therefore attaching them to the floor and top box thingy? Do i then place the foam baords between the battens therefore in contact with the container wall (wondering about the gaps due to the corrugattion)? Or do i place them on top of the battens thus leaving a gap between the boards and the wall? Then i add a plastic vapour barrier sheet over the boards? And then on top of that do i attatch plasterboards? Hi!, you answered most of my questions. I wanted to ask you, I have a shipping container, and I´m planning on leaving the roof without a second roof, I just wanted to leave it like it is. I was thinking of using a liquid polyurethane membrane, with a geotextile blanket that it’s used to put between layers. And on the inside just regular aluminum polyurethane foam. Do yo have any other suggestion? Do you think that spray on foam insulation can be sprayed on top of that membrane on the outside roof? is it resistant to weather? I haven’t read all of the posts on this site but in all of my perusal of available info concerning container re- purposing I have yet to see anyone mentioning refer containers. They are already insulated for refrigeration purposes and there are a large number of them available for not much more than there steel box cousins. Thanks for all of the great information! I have a 20×8 shipping container than I’m making into an office. My plan is to frame the interior out with either 2×2 or 2×4’s as a “box within a box” so I don’t have to create any more holes in the exterior walls than necessary. Place the verticals over the outward corrugations, and do closed cell spray foam (2″) for insulation. I live in the pacific northwest and I’m doing this project in the middle of the rainy season so there is already condensation on the ceilings, and also at the entrance of the container. My question is this– Can I go ahead and just frame it all out and do the spray foam despite the already damp conditions inside the container? Or am I going to just be locking the present moisture in? Things don’t dry out here well in the winter. So getting it perfectly dry inside would require some very special effort. Thanks, everyone! Just the site/thread I’ve been looking for! Sounds like this main example plus most who have chimed in do not have to be worried so much about winter and freezing. Does anyone have any advice for a container home that will be in a freezing climate (mountains of Colorado) and up on piers? So there is not a crawlspace below. We were going to spray foam, but the plumbers say that isn’t enough to protect the P-traps, and certainly we need a way to get the water supply from the ground up to the container (and then run to various places in the house of course.) They don’t believe spray foam will be sufficient for water lines underneath the container either. Currently we are contemplating heat tape or probably better: a “loop” of hot water line on a boiler designed for radiant heat.